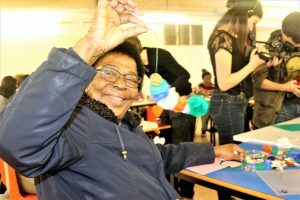 This is my post about my visit to a craft session for seniors at Grahame Park in Colindale. If you can’t see the video please click here. We all start off life doing little craft projects. My toddler Bonnie is obsessed with cutting and gluing anything and everything at the moment. It doesn’t bode well for the cat! Crafting and DIY has always relaxed me, I know that. 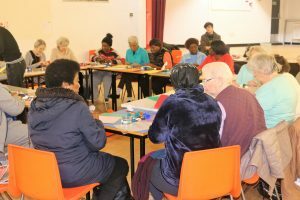 A senior craft session at Grahame Park in North London taught me something else. 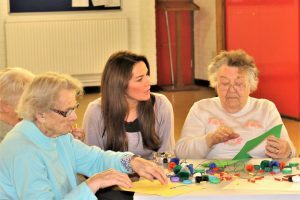 This very special day showed me that an enjoyment of crafts can actually prevent isolation later in life. 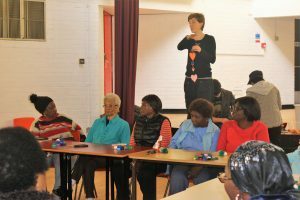 Grahame Park Independent Living organise this weekly gathering. They had just finished some exercise when I arrived and were setting up for this session. Staff and volunteers from Groundwork London’s The Loop @ Grahame Park were running this particular class. The Loop’s Andrea demonstrated how to make a decoration out of some items people generally throw away. It was great to have the theme of reducing waste, and was such a simple but fun project that certainly had people smiling. I was hoping to join in but actually just got carried away chatting with ladies… and one brave gentleman! Many of them explained that doing sessions like this helped their concentration and dexterity. It reminded me of my grandfather who took up tapestry in later years when he became housebound. He explained to me that it’s easy to stop doing fiddly things when it becomes harder, but persevering will help to keep your fingers and hands in working order. One lady I spoke to called Rita had been coming for 15 years. She said that it was an important part of her week to get her out of the house. Although she was lucky enough to have family around, they were all at work during the week so it could be lonely at times. Quite a few of the ladies I spoke to echoed this. They all said they had made many friends there, and I could well believe it as there was such a tremendous atmosphere. Quite a wicked sense of humour around! Although this was a bit of fun, many said they had picked up some really useful skills. One lady had even learned to sew and was making things for her family now. 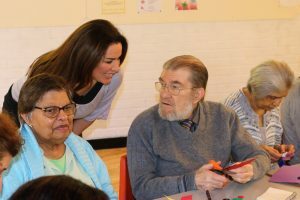 You hear a lot in the news about stats on loneliness and isolation, so it was wonderful to see such a positive initiative in action. 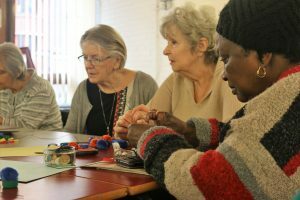 It certainly brought home to me that as long as there are still events like this when I’ve retired, my love of craft will be my friend throughout my life. If you haven’t seen my post on The Loop @ Grahame Park, it’s another wonderful story of the fantastic initiatives run by Groundwork. Great Video Georgina, we have a centre close by that does the same thing. There should be more places that do this. Gives a purpose and a reason to get up in the morning.!! So important – it really was a lifeline to many I talked to there.